On November 26, 2013, I published an article titled “Surviving Bad Years”. Today, December 31, 2016, is a day to pause, reflect, and make plans for 2017. As a reflection, I am re-releasing an article written three years ago. I wrote this after one of the worst years in my coaching career. Coincidentally (or not? ), I was also at a low-point in my personal life. “Little Victories”, an album by Chris Knight, was released in 2012 and became a soundtrack of my down times. I love the words “little victories”. When coaches are facing insurmountable odds, we must find little victories. When we find ourselves dealing with tough times in our life, we must find little victories. I remember running 20:05 in a 5K at age 30. I was so disappointed. I had trained hard to break 20:00. It would be the closest I ever got. Now, at age 57, I have readjusted my goals. I will never again weigh 185 pounds and I will never have a chance to break 20:00. Today, a 30-minute pain-fee run is a little victory. When I reflect back to three years ago, I realize I’ve strung together an impressive number of little victories. They add up to very good things. 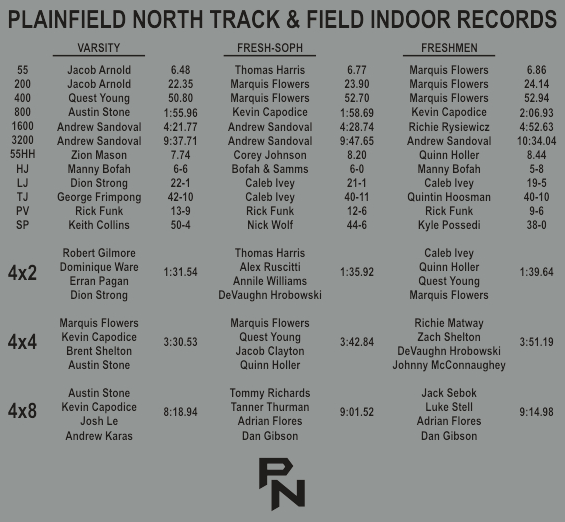 My teams have been solid for the past three seasons and this year could be a banner season for Plainfield North Track & Field. My personal life, coincidentally (or not? ), reflects the same enthusiasm for 2017. I’ve often heard that athletes and coaches must have short memories. Losing hurts too much. I am lucky to have the power to write my story (we all do). I am thankful to have the ability to remember the best times and bury the bad. This article is therapy for me. By bringing 2013 back to life, I am grateful for the hundreds of little victories of my past three years. Grateful is maybe the most important word in a life well-lived. Every coach wants the recipe for success. This article is a recipe for surviving failure. Ever go to a clinic to learn how to lose? Experts on losing don’t draw big crowds. However, if you are going to be a career coach, you better learn how survive the bad years. Coaching the disadvantaged team should be the first chapter in the coach’s textbook. I learned how to coach from my father. Don Holler was a head basketball coach for 44 years. He also coached football, track, baseball, and tennis. Dad was a tireless worker and an extreme competitor. He won 631 games as a basketball coach. However, it was losing that truly defined my father’s character. Dad lost 449 games (maybe some kind of record?). My father was a creative coach when his teams weren’t good enough to win. Unlike many coaches I know, my dad loved his players even when they lost. He did not take the fun out of practice. He was a master of encouragement. Dad understood that losing was a teachable moment. How else can you survive 449 losses? “You are only as good as your next game.” Win or lose, our inertia must be forward-moving. The past is past. I learned survival skills as a young basketball coach. At the age of 23, after just one year of being a sophomore basketball coach, I was named head basketball coach at Harrisburg High School in 1982. At the time, Harrisburg had about 700 kids and was one the smallest schools in Class AA (only two classes back then). I inherited a team who had lost 35 consecutive games. In addition, Harrisburg basketball had achieved only one winning season in the previous 20 years. We played in the South 7 Conference where basketball was king. We were a football school in a basketball league. Four schools (Carbondale, Marion, Centralia, and Mt. Vernon) were twice our size. Rich Herrin, who later took SIU to national prominence, was the coach at Benton. Benton’s gym is named after Rich Herrin. Six of the eight head coaches in the South 7 were also Athletic Directors (and hired their own officials!). Even Harrisburg’s non-conference schedule was tough. Eldorado, McLeansboro, and Carrier Mills had terrific programs in the 70’s and 80’s. My 1982-83 team broke “the streak” at 37 and we went on to win four more games that year. We lost 89 games (yes, 89 games, that’s an average of 18 losses per year) in my first five years as head coach. I did all I could. I pushed all buttons. I believed in my players through thick and thin. With tons of hard work, we often overachieved. I’m still haunted by games lost at the buzzer. Opponents with better players seemed to always find a way to win close games in the final seconds. In my final three years as Harrisburg basketball coach, we won 14, 13, and 13 games (three winning seasons). We had an impressive 112 kids at my final basketball camp in 1989. Strangely, I was fired in a midnight coup d’état in March of 1990. I had been hired as the new head track coach at the February board meeting, one month prior. I still don’t understand. How can a school board hire you as track coach in February and fire you as basketball coach in March? I was totally blindsided. No administrator saw it coming. The board voted 6-0-1 to fire me and gave no reasons (no Due Process, no Just Cause). I was crushed. One more bizarre twist, I was hired as head basketball coach at Thompsonville H.S. (enrollment 97) for the 1990-91 season. I remained at Harrisburg as a science teacher and track coach. I coached a team that won 20 basketball games at Thompsonville. A few months later my Harrisburg track team won the 3rd place trophy at the IHSA State Meet. I’ve never heard of anyone being a successful head coach at two different schools, 20 miles apart. In the 1980’s I learned how to survive in hard times. The 1990’s were different. In track and field I had the opportunity to coach great teams. We won 8 state trophies in an 14-year span. We won the River to River Ohio Division in 94, 95, 98, 99, 01, 02, 03, and 04. We were Fr/So conference champs in 94, 96, 97, 98, 99, 00, 01, 02, 03, and 04. We were Sectional champs in 94, 95, 96, 99, 00, 01, 02, 03, and 04. The Southern Illinoisan “Track Athlete of the Year” was a Harrisburg Bulldog an amazing five times … Damon Lampley (95), Robert Neal (96), Patton Segraves (99), Brad Brachear (01) , John Perkins (02). My 1999 team was my best team. At the SIRR Conference Meet, 21 different guys scored a total of 214 points as a team, beating the second place team by 121 points. At the state meet 12 different guys scored points and we won the state title. 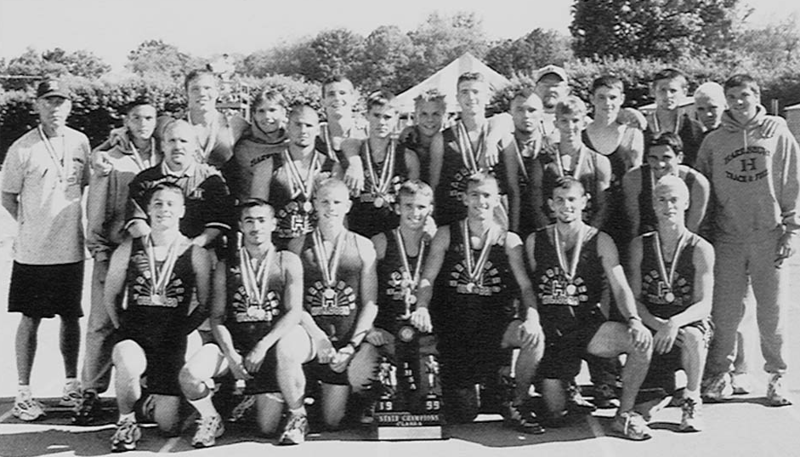 1999 State Champions Harrisburg Bulldogs, 21 scorers at the conference meet, 12 medalists at the state meet. 12 All-Staters on one team! Belleville West coach, Patton Segraves, to the right of the trophy. Triad coach, Brian Weiss, to the right of Patton Segraves. This was a once-in-a-lifetime team. It is therapeutic for me to remind myself of the good years. Last year (2013) wasn’t so good. This year (2014) may not be either. When going though lean years, garden like crazy. Plant good seed, pray for good weather, and fertilize with tons of bullsh*t.
My freshmen and sophomores are the most important kids in my program. I’ve always believed this. I hold this to be true in all sports. I also believe that SUCCESS is the most important experience for underclassmen. When I was a head basketball coach for nine years, only twice did I ever elevate a young kid to the varsity. Talented young athletes need to learn how to become leaders, not role players on the varsity. 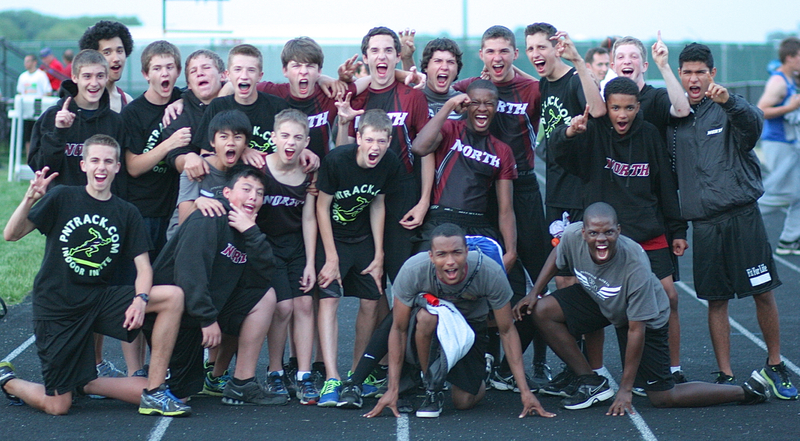 Some of our programs at Plainfield North are ruined by bringing up too many underclassmen. Development is stifled. The lower levels become embarrassments. When juniors and seniors see their jobs being taken by freshmen and sophomores, morale declines. Seldom do freshmen and sophomores truly improve the varsity’s chances of winning games. Even if they did, I believe it’s better to win or lose with juniors and seniors, maximizing the positive experiences of freshmen and sophomores. We once had an athletic director at North who did not agree with my philosophy. He said, “No freshman or sophomore ever earned a college scholarship.” I could go on an uncontrolled rant on that subject. Is that our purpose? Scholarships? Athletic scholarships sicken me. As with most things, money corrupts. With the ridiculous cost of college, parents are driven towards an unrealistic expectation of winning an athletic scholarship. Some Athletic Directors and coaches mindlessly jump on this bogus bandwagon. High school sports are educational. We are not the “minor leagues” for the NCAA. Let me reel it back in. What does this have to do with surviving a varsity talent-drought? Last year we had a weak senior class and a weak junior class. We did not have talented juniors and seniors walking the hallways of Plainfield North. Terrific athletes were not boycotting track and field. Actually there was one kid that didn’t come out. Jayden Gerber was a baseball to track convert his sophomore year. Jayden had an amazing rookie season and was our lead-off runner in the 4×1. We ran a school record 42.06 at Sectional and Jayden won a medal at the state meet. As a junior, Jayden got frustrated when his times remained stagnant. As a senior Jayden “trained” for the Air Force and went to work after school instead of running track. Jayden is now in the Air Force. He sent me a text recently saying he is looking forward to hearing about this year’s track team. He follows us on twitter. We sure missed him last year. Even when we do things right, we lose some kids. Anyway, back to last year. 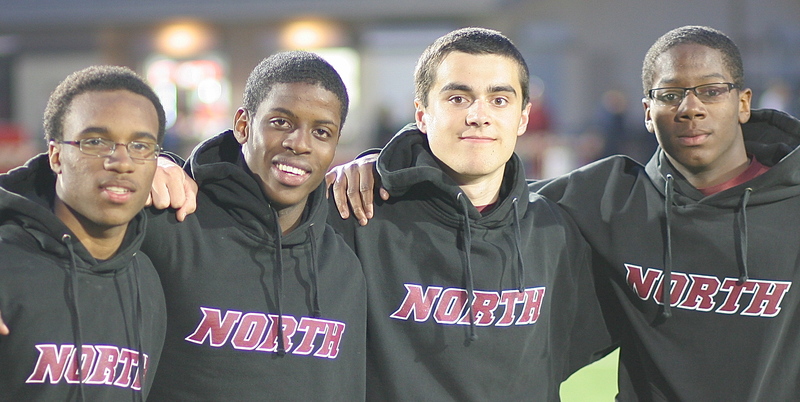 Our Jr/Sr class had only THREE guys who were on our freshman or sophomore record board (indoor and outdoor). Compare that to TWENTY of last year’s Fr/So class who presently hold records. Weak at the varsity level, terrific at the Fr/So level. This is the first year that we’ve made t-shirts with indoor records. 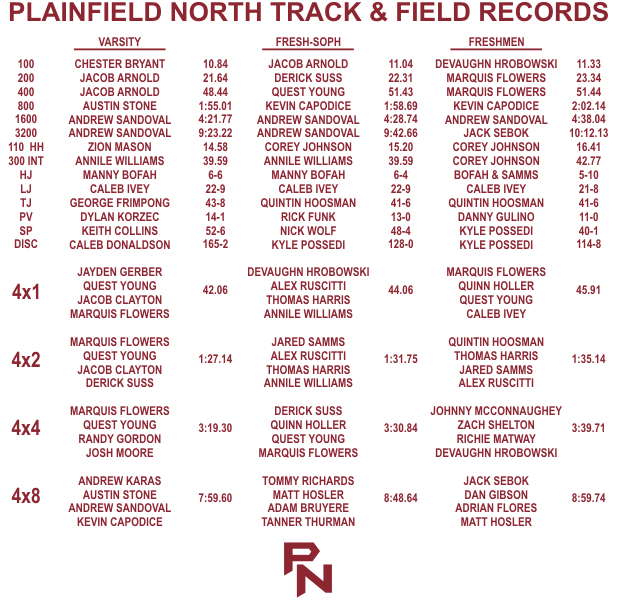 100 t-shirts will advertise and promote track & field at Plainfield North. “MAKING THE SHIRT” has become a goal of all PN track athletes. It’s a living record board. So what did we do? First of all we talked to our senior captains. We encouraged them to nurture our freshmen and sophomores. We encouraged our captains to be “big brothers” and treat our freshmen and sophomores with respect. Kids like to be nurturers, but they need to be taught. In our preseason coaches’ meeting we articulated a plan to create an atmosphere of success even though we would not be competitive at the varsity level. We broke 21 school records, some of them more than once. 16 of the 21 records were at the lower levels, but that’s fine with me! We qualified two individuals for the state meet, Zion Mason (14.68 in the 110 HH) and Manny Bofah (6’6 in HJ). Corey Johnson was a near miss in both hurdles (14.93 & 40.08). We placed an embarrassing 7th in the SPC Varsity Conference Meet but we celebrated our first-ever Fr/So Championship. Even our varsity athletes enjoyed our Fr/So success. Jared Samms, Annile Williams, Alex Ruscitti, and Thomas Harris. 1:31.75 is a healthy time for a sophomore 4×2 relay team. We also ran 44.06 in the Fr/So 4×1. We placed an unimpressive 9th out of 15 teams at the Joliet West Sectional. We ran an all-freshmen 4×2 and 4×4 team. We broke the freshmen 4×4 record and just missed the 4×2 mark. We also ran a record-breaking Fr/So 4×8 team at Sectional. We created an atmosphere of excitement, even though we were competing in the slow heats. We won the Kaneland Freshmen Invitational for the 2nd straight year. 2013 Kaneland Freshmen Invite Champs. Repeat champs with a totally new group. 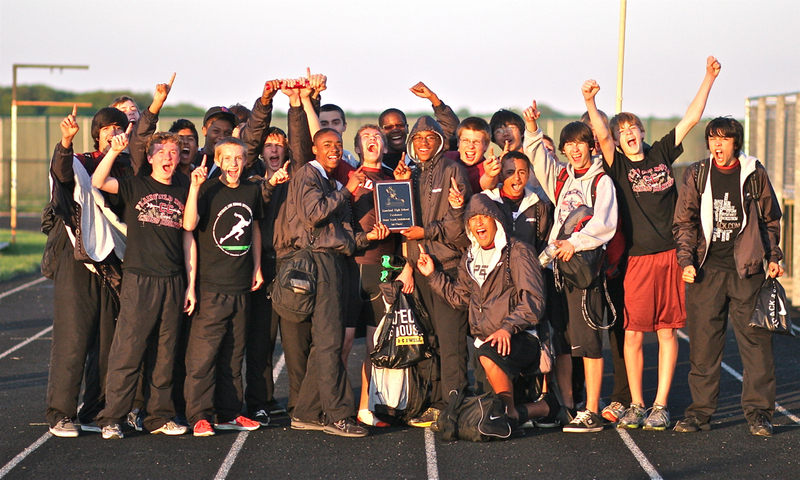 2012 Kaneland Freshmen Invite Champs, this year’s junior class. 11 of these guys have names on the back of this year’s t-shirts. As a coach, you must define success to your team. If you don’t, someone else will. This year we will have two great classes (freshmen & juniors), one good class (sophomores), and one nearly non-existent class (seniors). My preseason roster has only five seniors. I don’t know if any additional seniors will survive cuts. We will be young for one more year. Too many coaches buy into the myth that great teams are the products of master coaching. Too many times coaches truly believe that they can strategize their way to victory despite their talent deficit. We are gardeners, not creators. 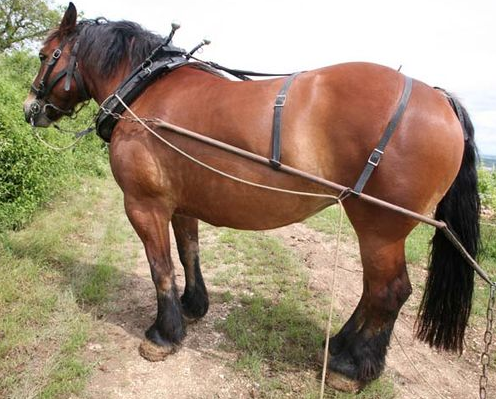 Plow horses don’t win the Kentucky Derby. No training program or strategy session would make this horse into a Kentucky Derby winner. Another great article. There’s even a picture of my brother. I love reading about the history from HHS. We always read what Tony Holler has to say, here in England.